It always makes us feel the food is healthy when it shows a shade of green in it. Its not just a feeling but its true too. Broccoli is a very healthy vegetable. Wikipedia says that broccoli is high in vitamins C, K, and A, as well as dietary fiber. It also contains multiple nutrients with potent anti-cancer properties, such as diindolylmethane and small amounts of selenium. A high intake of broccoli has been found to reduce the risk of aggressive prostate cancer. Broccoli consumption has also been shown to be beneficial in the prevention of heart disease. Simple stir fry is the best that can be made with the green veggie since it does not have to be cooked much and it maintains the original taste of broccoli. 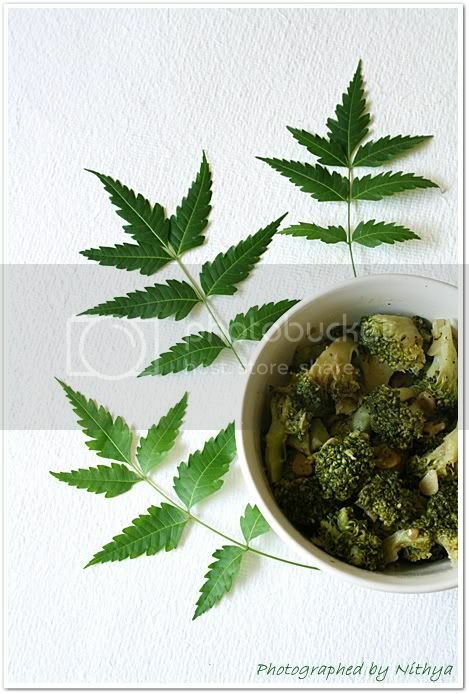 Cut the broccoli into florets and cook them in microwave. I prefer microwave for broccoli since it preserves the color better than cooking on stove top. Peel off the skin from garlic and slice them very thin and keep it aside. Heat a frying pan or wok over medium heat. Add olive oil / ghee and once it gets heated up, put in the sliced garlic and fry for few mins till they get roasted slightly. (I like them a little crisp). Now add the cooked broccoli and saute for few mins. Finally add salt and white pepper to it. The flavor of garlic and olive oil gets marinated into the broccoli resulting in a very aromatic stir fry. :) Simple isn't it??!! You can eat it just like that or serve it with ghee rice. When buying broccoli look for firm ones with compact clusters of small florets. The buds should be dark green and may have a purplish tint to the edge which does not matter. 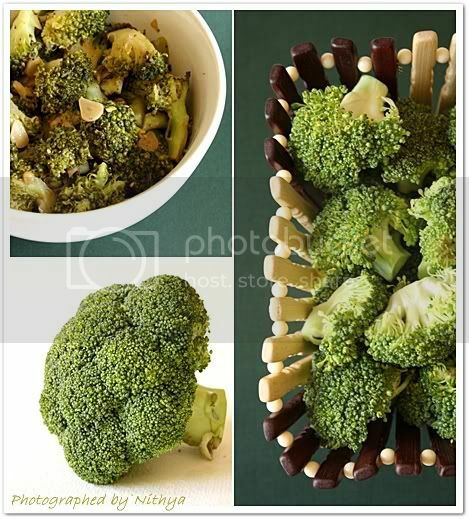 If the florets are opened, yellowish-green or enlarged then the broccoli is not fresh. Prefer not to buy them. Try and buy your broccoli just before you need it. You can store broccoli in the fridge, in an open plastic bag, for up to three days, but the vitamin content will diminish the longer you leave it. 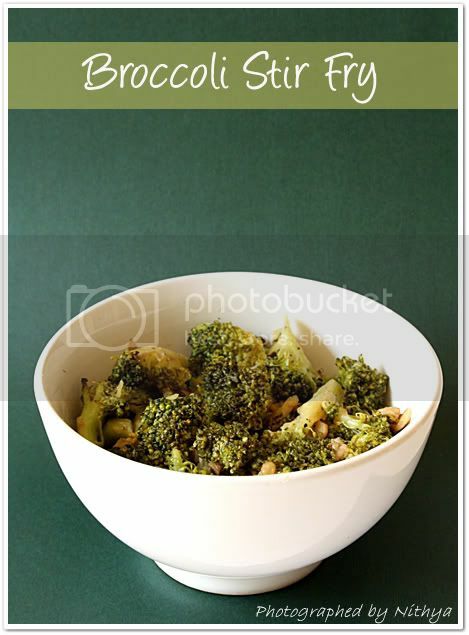 Broccoli can be boiled in a small amount of water on stove top, microwaved with almost no water or steamed on a rack above simmering water, or stir-fried. Be sure not to overcook broccoli or it will turn too mushy and will develop into a very unappealing shade of green as well. Wonderful nithi .. Our fav one too.. all the pictures are good dear. 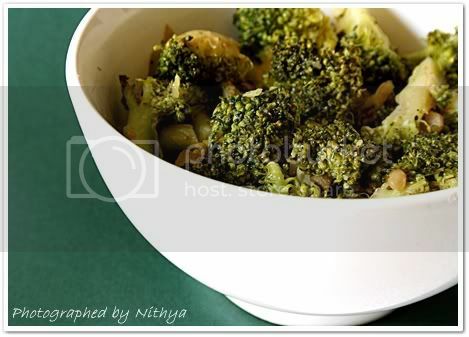 Stir fried veggies are always a winner atleast for me :) Love the last click..superb gal! Lovely stir fry.. Looks awesome.. Broccoli stir fry looks really good. lovely and healthy stir fry with wonderful pictures. My favorite way to cook broccoli. Lovely pics. I love this sort of simply stir fry, looks yumm! looks great.. we also make similar stir-fry with broccoli... and sometimes to add an little Indian touch we add sambar powder too..
Lovely pics !!! Like your tip column too. I lve this veggie. Very healthy and simple to make. Where can we get broccoli in our area ? wonderful..simple and tasty stir fry. A simple and delicious stir-fry ! Nice info on broccoli ! Simple and healthy fry..Useful info dear. Superb photographs! Tempt to try this recipe immediately! I never knew that this greeny has the power to avoid heart diseases. I hope I should try to use it as I am living in a polluted city prone to diseases now and then. 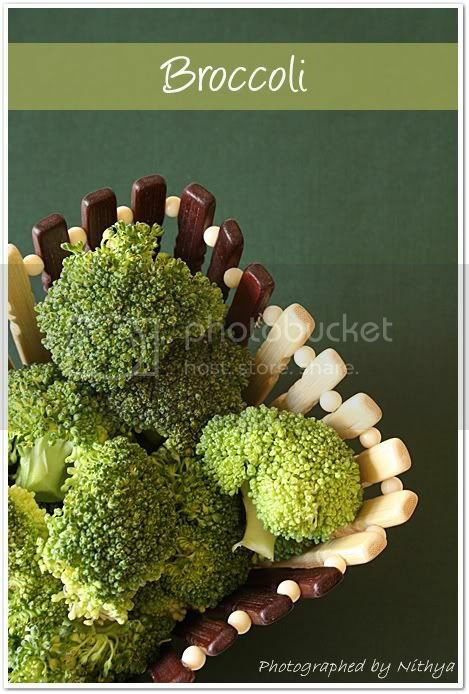 Love broccoli, and this surely is a treat. Lovely recipe and awesome pics! New Diet Taps into Innovative Plan to Help Dieters Get Rid Of 12-23 Pounds within Just 21 Days!